One of the things that SUDA does quite well is to provide good feedback messages about errors in the drainage network configuration to help guide you to the correct fix. This message really only tells us that there is a problem with no information about where to start looking. This message apparently serves as the fail safe for unknown errors that otherwise would probably have caused a crash. Imagine inside the software that there is a long list of error checks, any one of which will stop the computations and give a usually very helpful message. But then, after going thru the list something is still wrong which was not part of the checklist. The software decides it cannot proceed with a computations without risking stability or data issues. That is apparently when this message appears. This error can be caused by a great many errors, not all of which have been cataloged by Bentley, but one of the common ones is a bug in the software which does not properly handle the use of 3D length on the pipes. In my example shown here, I can open the Haestad User Notifications for a tiny bit more information. We can see here that the problem was encountered in the pressure engine. So, it must be related to pipe calculations. That helps but still leaves a lot of settings and configuration items to review. Unless an obvious blunder can be found then I’m faced with trial and error testing of every parameter. One of the common causes of this error, but does not appear to be an error, is a setting to use the 3D pipe length. 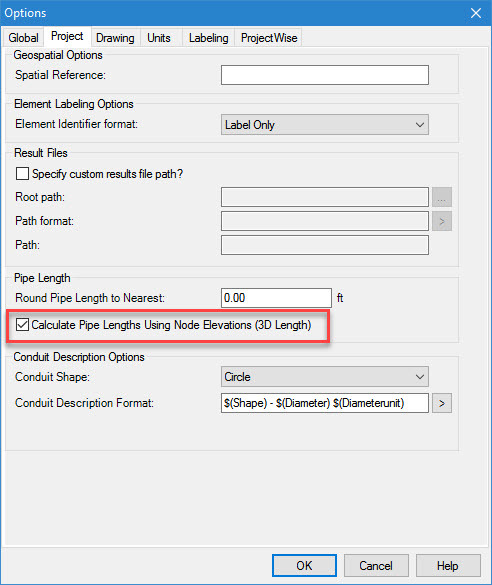 In menu Project > Project Defaults, there is a setting to use the 3D pipe length in calculations. You may well review this and see that the check box is set but unless you know that there is a bug in the software would not think this is wrong. You will want to make sure this is turned off. Bentley has confirmed a software bug which will prevent computations when this is turned on. After checking this, if you still get the failed scenario message, you will probably need to place a support call to Bentley and send your file for evaluation. Bentley developers and support team have tools to trace the error which are not available to us.